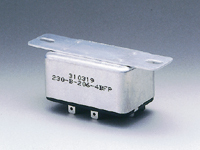 While all bimetal thermostats in the world are designed based the protector type, Matsuo is establishing its unique position as a manufacturer of the control type thermostat. Matsuo is company that has concentrated all its efforts solely in this business for the past 40 years. Recently, Matsuo has begun uniquely expanding their product coverage to include electronic thermostats and high temperature type thermostats. 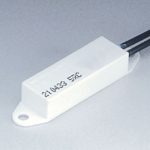 Temperature Power Sensor(TPS), which is a main product, is the high performance control type thermostat equivalent to the performance of electronic thermostat. A small differential, long life, compact seize and low price are ideal of this model, and there is no products to be substitute in the world. 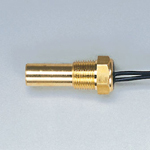 A control type thermostat for high temperature is a unique product. Temperature control or protection at 250°C or higher, which is impossible by the disk type thermostat, can easily be done. 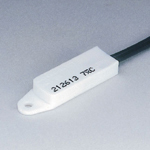 The disk type thermostat is the ultimate protector, which can cut off a heavy current without fail at a low cost. We believe that there will be no substitute for this thermostat for the time being. On the other hand, the differential is large in the case of the disk type, and the preset temperature will change if the operation is repeated frequently. As a result, it cannot be used as a controller. If you need a long life and a small differential for your controller application, please select our TPS thermostat. Standard disk type thermostat with automatic reset function. Body thickness is 12.1mm. Standard type with manual reset function. It has a safety structure to prevent the contact from being reset unless a button is pressed when the temperature becomes as low as room temperature. not available. Manual reset type. Sophisticated design for reset button section. Once the contact trips, it will not return to the original position unless a button is pressed manually. *Operation type B is not available. Overseas standard numbers and certification numbers. 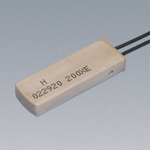 The thermal timer is a delay relay which has a delay time of on delay/off delay. It operates within a range of 10~200 seconds, and it has an M contact (make contact) and B contact ( break contact). Because bimetal is the principle of operation, it will naturally be influenced by the temperature change in summer or winter. A bimetal for outside air temperature compensation is provided in order to minimize such influence. BF, BA, BH type etc. •Both delay time and off delay time setting can be made by one thermal timer. •While auto reset is the standard, manual reset type can be made upon your request. •Contact capacity is available in 3A, 6A and 10A. •Because of out side air compensation bimetal, operational time is the same for summer and winter. •Anti vibration and anti shock characteristics are superior compared to other types of timers. •Because all Matsuo thermal timers are housed in a dust free case, there is no contact error due to dust or other contaminants. •The price is low compared to other type of timer. •Because the B type has a sharp mechanism for repeated on/off, there is almost no noise observed. ·For the automatic operation of boilers, coolers, copy machines, freezers, etc. ·As a delay element of home appliances. ·For the cutting off and resetting of over current for the certain period of time. ·As an automatic control program timer for automated machinery and industrial machinery.